Our mission is to demystify and democratize conjoint analysis. We want the most effective form of customer research to be easily available and accessible so business users everywhere can benefit from it. Conjoint analysis is the No. 1 research technique employed by the world's leading brands to understand and measure customer preferences. It measures how consumers value features of a product or service. Dictionary definition: "Conjoint: Joined together, combined"
Marketer's catch-phrase: "Features CONsidered JOINTly"
Customers make purchasing decisions based on features they either like or dislike about a product or service. Consider how hard it is for marketers to select the right combination of features out of thousands of possible combinations, not to mention assign the right price to generate the highest appeal. In reality many marketers make educated guesses based on historical behavior as to what features appeal to customers most. But given the speed at which fads can change, basing any customer preference assumptions on past performance is highly risky. There is however a proven way to help marketers cut through the chatter and better understand customer preferences - enabling them to package the right features at the correct levels, priced optimally to ensure the best chance of success. Conjoint analysis is the marketing research technique used by world leading brands like Coke, P&G and Diageo to predict how products will perform when taken to market, or tweak existing products to maintain or grow market share. Unlike the common Yes/No or "tick the box" approach to surveys, with conjoint respondents choose from realistic product options which mimic real world purchase scenarios. 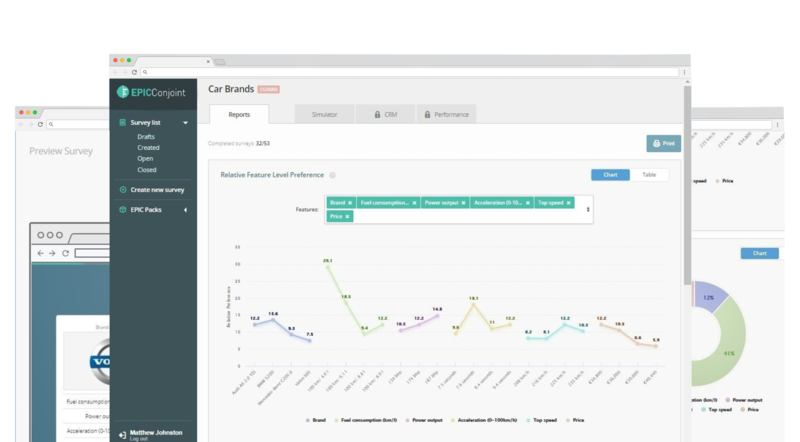 Conjoint can also be used to provide a quantifiable measurement of the elements underpinning a brand’s value perception (vis-à-vis competitors), and help explain movements in customer experience metrics. At EPIC Conjoint we are passionate believers in the power of conjoint analysis from our own experiences working in global companies. But we were massively frustrated at the amount of time, effort, and the cost barriers to conduct a conjoint survey. So instead of accepting these limitations, we decided to do something about it. We are commercial marketers and statisticians with a substantial amount of experience working in top tier brands, who want to demystify and democratize conjoint analysis. We believe conjoint analysis isn't rocket science and should be available without constraints or limitations - it can, and should be used liberally by companies to help derisk and validate commercial activities. A broad spectrum of use cases exist across industries and sectors that require critical management decisions which should be underpinned with conjoint analysis. We have created the first conjoint platform designed for commercial users. It's also suitable for academics, political scientists, psychologists and market researchers.